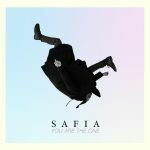 Another great track from SAFIA. In which SAFIA actually do deviate from the formula. The crazy electronics are left to the background where I barely notice them, and instead you get a smooth ride that feels like a combination of "Sing For Absolution" (the piano) and "Time Is Running Out" (the R&B swagger about the second verse. Only set back is that it feels as though it ends a little soon, but it hits the targets it aims for. Awesome effort from Safia! The crazy production, while at first sounds all over the place, actually comes together in perfect timing. Vocals are excellent to top it off and all aspects of the piece compliment each other well.